The Federation of Fly Fishers is one of the premier organizations dedicated to conservation, preservation, and education in the world of fly fishing. Whether you're just getting started in the sport, or have the veteran status marked by a vehicle festooned with decals - anytime is a good time to join. 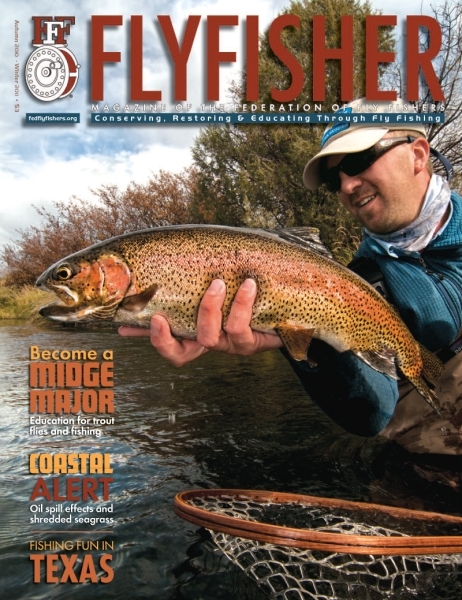 One of the perks of membership is a subscription to FlyFisher Magazine. FFF can also be found on Facebook. I appreciated working with Al Beatty on the cover of the Autumn 2010/Winter 2011 cover of FlyFisher this past month. "Mr. December" is Worldcast guide Casey Birkholz. This image was taken 10/15/2010 using a Nikon D300, Tokina 12-24mm lens, and a Tiffen HT 0.6 ND Grad Filter. I want to be a midge major. @Landeen - Are midges allowed at FGFF? That McRib photo would not have been anywhere near as nice with size 28 Griffith's Gnats. Huck meat. Great pic Brett, will check it out.